Want to become a self-confident writer, who writes effortlessly? Writing is both a skill, and a habit, and over time, writing will come completely naturally to you. Here's how to speed up the process. When you first start writing, whether as a hobby, or as a prospective career, you'll experience lots of self-doubt. This is natural. However, don't let your doubts keep you from writing. You need to write, every day, so that you get into the habit. Once you've developed your writing muscles, writing will be much easier than it is now. You'll write as effortlessly as you speak. Read the entire article: "Writing Quick Start - Three Steps to Success as a Writer". In this week's issue of Fab Freelance Writing Ezine our feature article is "Write Articles Fast - Plan and Write More". Want to write articles fast? The secret is simple: it's planning. Let's discover how to plan your articles. Your ability to write quickly is essential because content is king online - and offline too. As the Web becomes more competitive, site owners and businesses realize that the more content on their site, the better. Additional pages provide additional access points for site visitors. Those additional pages are often in the form of articles, so if you can provide articles fast on demand, you're golden. I separate the planning stage of writing from the drafting and straight writing stages, not only for speed, but also because each stage of the writing process demands a different mind state. Since it takes around ten to 15 minutes or switch from one mind state to another, separating planning from the other stages makes sense, speed-wise. Read the rest in tomorrow's ezine. Your subconscious mind is your partner in your writing. When you separate the writing process as we discussed in "Write more when you separate planning, writing and editing", you'll become aware that your subconscious mind does most of the heavy lifting in writing - it's responsible for most of the planning, and the writing - your conscious mind, the part of your mind you think of as "you", just takes care of the editing. Your subconscious mind is powerful, but it's not verbal. It sends you information via images and sensations. When writers discuss their processes for writing a novel for example, you'll often find that they began with a single image. An entire novel flowed from that image. Before you start writing for the day, pause. Relax in your chair, and take a few deep breaths. Then focus on the breaths, just breathe, and be aware of your breathing. If you've done any meditation, you'll recognize this as a meditative technique. Give yourself a minute or two of relaxation. If you have a question about your writing, write it down. Then relax again for a minute or two. An image or a thought will arise in your mind. Start writing. Once you become aware that your subconscious mind "writes", you can pause occasionally to give your subconscious an opportunity to bubble up its input. You'll find that your writing is not only more powerful, but it flows more easily too. Discover how to write with your silent partner with my ebook "Top 70 Writing Tips To Help You To Write More". Perfectionism is a writer's curse. The first step in breaking the spell of perfectionism is to recognize that you're under its spell. Once you've recognized that this is your challenge, you can eliminate perfectionism for good. Start by telling yourself that your writing doesn't have to be perfect. It just has to get done. If you wrote it, you're unlikely to be a good judge of the writing's perfection, or lack of it. It's much better to ask: "Does the writing achieve what it's supposed to achieve?" Often a writer who's rewriting obsessively started his project without defining it. This is like setting off on a mystery tour and then wondering why you haven't reached your destination. You can't reach your destination, because there never was a destination. If you're sure that there's something wrong with the writing, and you're not sure what it is, send it off to the buyer if it's been commissioned, or put it away and work on something new if it hasn't. The buyer will tell you what's lacking. If you've put the writing away, then with some distance from it, in a month or a year, you'll be able to pick the flaw, if there is one. Often there's no flaw - you're just too close to it. The concept of "perfect" cripples you as a writer. Creativity is not clean and clear and perfect, it's messy. Realize that messiness is a good sign that your writing is creative - it may be the best writing you've yet done. Allow your writing to be messy. Unfortunately, creativity involves anxiety because you're using your right brain. Whenever you're using your right brain, researchers have found that you experience some anxiety. That's just the way it is. Your perfectionism is a desire to eliminate your anxiety. In the process, you may kill all the creativity in your work. Go for a walk, or go to the gym - physical activity will relax you. No matter what high hopes you have for a piece of writing, you soon come to realize that the fun of writing is in the writing - not in anything that comes after it. Since that's the case, relax and enjoy your writing, in all it's messiness and imperfection. Bonus Tip: Write more. 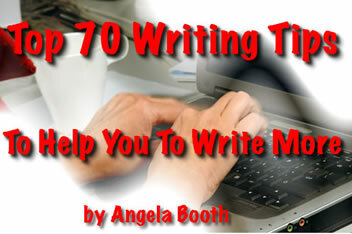 Read my ebook: "Top 70 Writing Tips To Help You To Write More". When you write more, you're less likely to fall under the spell of perfectionism. You'll eliminate that particular writer's curse for good. I had to say thank you, thank you! Angela, you wouldn't believe the change in me. Over the past year, my marriage ended, and my son decided to live with his mother. I had surgery, and then I was let go from my job. I'm on medication for depression. Before I bought your ebook, I couldn't write at all. I had the world's worst case of writer's block. Sitting down at the computer made me nauseous and dizzy. No one has a perfect life. Therefore it's useful to be aware of negatives in your life because once you acknowledge the negatives, you can let them go. You don't have to do anything directly about negatives. In fact, if you struggle with a negative situation, it will tend to become worse, because you're giving it energy. Your journal is a useful place to write down your "don't likes", whatever they may be. Don't be afraid to write about the negatives, even if it makes you anxious. However, when you're writing, don't try to solve problems, or make lists of what you should do. Simply acknowledge. Well, I did it. I wrote down everything negative. Everything. It was like a dam burst. Writing it all down released something. Now I'm back to writing, like I used to write, but better. I'm writing MORE than I've ever written before. I had to let you know. Thank you from my soul.